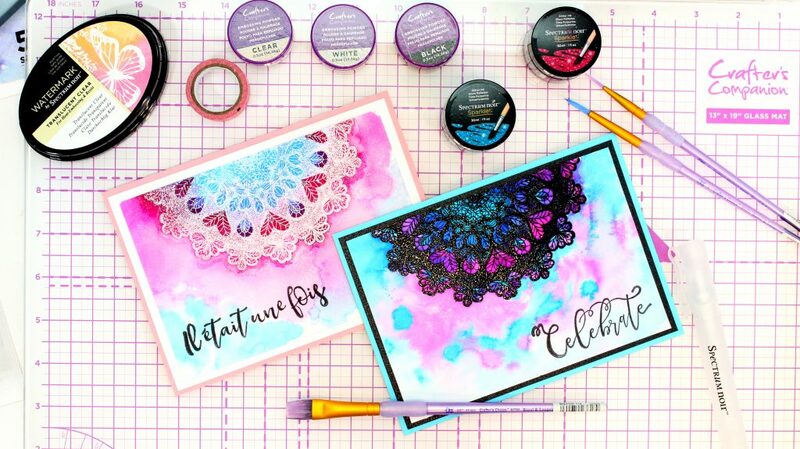 Crafters Companion > Blog > Watch Along Wednesday – Spectrum Noir Sparkle Inks! Watch Along Wednesday – Spectrum Noir Sparkle Inks! Welcome to the very first week of our brand new weekly blog post, Watch Along Wednesday! In this series, you can expect to see demonstrations of our newest products, as well as ideas on how to get the most out of our previous products. Whether you’re watching on your lunch break or cosied up at home with a cuppa, we’ll be here every Wednesday with a brand new video. You can also join the conversation on social media using #WatchAlongWed! To kick off Watch Along Wednesday, we’ll be following David as he uses the Spectrum Noir Sparkle Inks and a heat embossing technique to create an exquisite, mandala-inspired card. Take a look at the video below! 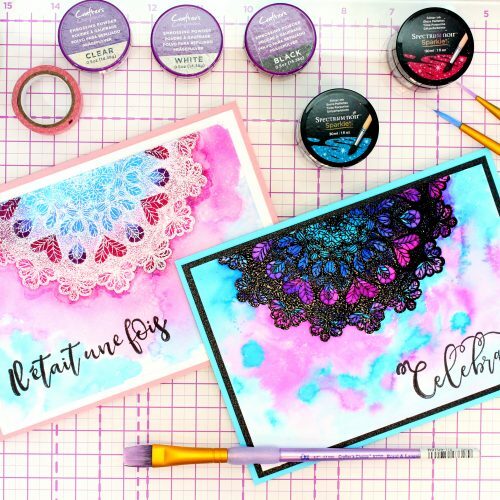 The Sparkle Glitter Inks from Spectrum Noir are perfect for the Crafter or Colourist who wants to experiment and get messy. Their shimmering, vivid colours will dilute and blend almost endlessly, for a range of easy-to-achieve artistic effects that are simply stunning! These Inks take inspiration from the much-loved Sparkle Glitter Brush-Pens, so each colour of ink has a matching pen. However, you receive 30ml in each jar, which is over four times the amount of the 7ml pens, so you’ll have plenty of ink for all of your projects. The fluid colours of the Sparkle Glitter Inks are infused with a perfect sheen of dazzling glitter. Their high pigmentation can be watered down to offer an exciting range of sparkling gradations and blended colour effects, so creating seamless transitions between colours is simple. A single colour can be applied with almost limitless range, thanks to the high intensity pigment in this product. This means that a little goes a long way and coverage is greatly increased for knock-out colour payoff. With the added glitter running throughout, you’ll be left the most beautiful and eye-catching artwork! Tune in next Wednesday to see an Easter-themed video! 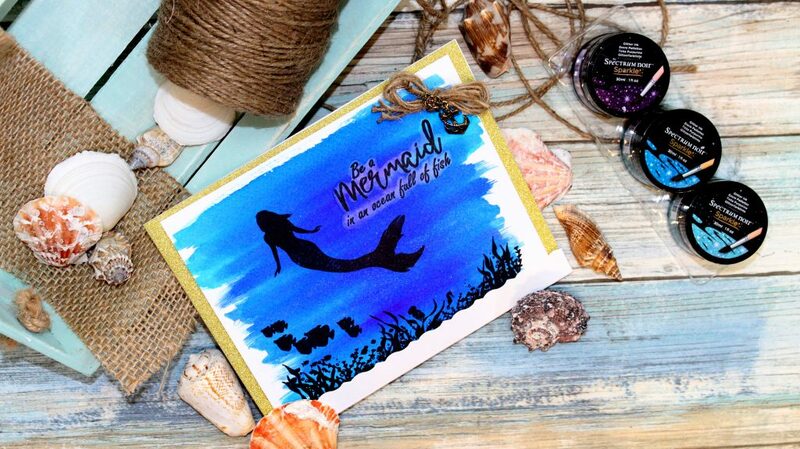 In the meantime, make sure you post all of your Spectrum Noir Sparkle Ink creations on social media for us to see using the #WatchAlongWed hashtag!